All summer I’ve been bemoaning my lack of cooking space. Our home was built in 1979, and it still has the original appliances. The sink in the master bathroom has some accessories dated 1985, so I’m not sure of the exact date of the JennAir range, but it’s probably between thirty and thirty-five years old. Possibly older than I am, if anyone was wondering. 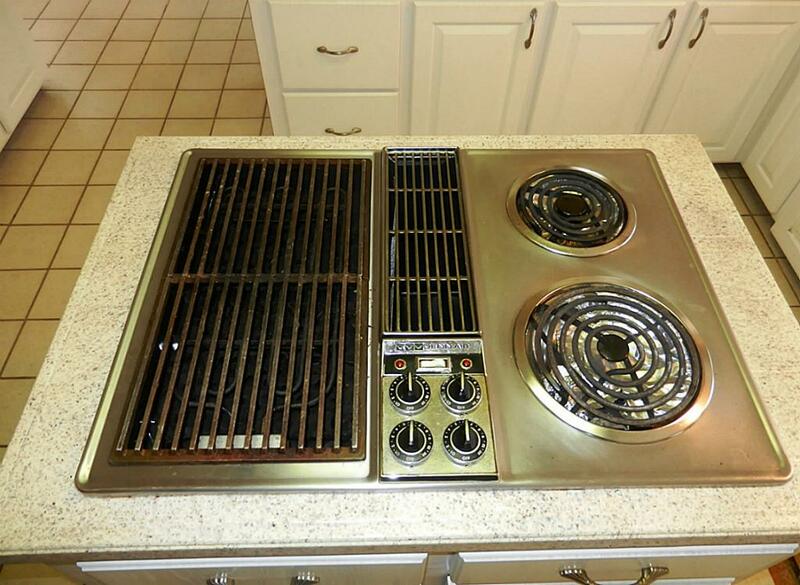 And it has two burners. They’re set pretty close together, too, so using the big pressure canner is challenging — the canner overlaps the second burner, so I always worry that the food I’m heating prior to canning won’t cook evenly. It also has a griddle above an odd-looking heating element. The griddle can be switched out for a pair of grills, which I have assumed are intended for using to cook meat. I’ve never used them because we have a nice barbecue of which Aaron is very proud, and even on chilly days it’s not a big deal to fire it up and cook on it. A JennAir range. Not mine. Mine is too grimy to be featured in its own post. She went on to explain that the heating elements across from the burners were designed to heat pots, too. You just put the sturdy grills on instead of the griddle, and away you go. I hadn’t had a clue. I’ll admit I had thought of it, in the irritation of trying to heat a pot that was only resting 2/3 of its bottom on its heating element, but I dismissed it as a silly and impractical idea. I still can’t believe I never looked it up online — or asked my mother-in-law, who has also used one of these ranges. But there it is. A whole summer’s worth of struggle, ended in one brief conversation. Ah, well. C’est la vie — that’s life. There’s always next summer. Small note: The photographs you see on my blog are generally my own, with the exception of my post “Remembering…Drying Fruit,” which features a stock photo of a sales model of a cast-iron range and an ad for an wringer washing machine. For this post, rather than photograph my own range (which needs to be cleaned with more elbow grease than I currently have available), I also used a photo of an identical range that I found online. Salvaging my pride, one tiny step at a time. Sorry.